We are located in Eastern Connecticut. 5 minutes from RI line, 45 Minutes from Worcester, MA. Welcome to Cedar Lane Apiaries, LLC! Due to recent weather conditions in California, our packages have been delayed. Rain has caused problems with getting queens mated. OHB will not sell us packages if they are not confident about the quality of their queens. We thank you and appreciate your patience. Did you know that one-third of the U.S. diet is derived from insect-pollinated plants and honey bees are responsible for about 80 percent of that process. Without the honey bee's pollination work, the quantity and quality of many crops would be reduced and some would not yield at all. 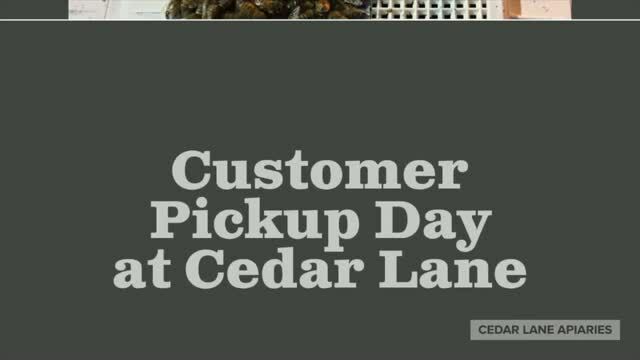 Cedar Lane Apiaries provides healthy honey bee pollination units to Connecticut/Rhode Island and Massachusetts. It's that time of year again to start ordering packages for this spring. And Cedar Lane is looking forward to providing them for you. We will again be offering 3lb OHB packages from northern California with your choice of Italian, Carniolan or Saskatraz queens. For pick-up on either April 7th or April 14th(**this date has been changed due to the fact that the 21st is Easter Sunday. If you ordered a package for April 21st, we will be sending you an email to let you know the situation. **) , at either Benedicts Home & Garden in Monroe, CT or Cedar Lane Apiaries in Sterling, CT. Information about these queens' traits are provided in their product descriptions. Unfortunately, Olivarez Honey Bees and Mann Lake, in Pennsylvania who is our only viable source for these packages have both decided to greatly increase their price from last year. We apologize that our prices must reflect this increase. We have determinedly considered all our avenues, but the bottom line is; we can't justify selling you any packages that we don't feel confident in. We sincerely believe in the quality of OHB packages and queens. And we are comfortable and confident standing behind these packages and giving you the best chance at successful hives. We look forward to seeing our loyal returning customers and meeting newcomers to this fascinating obsession. We will be offering marked northern Californian Italian, Carniolan and Saskatraz queens available soon in both Sterling, CT and West Greenwich, RI. Our Equipment and Supplies list has been updated and there is a PDF list that you can download and print out.